As I was trying to just do a journal page, I reached for two materials I don’t use a ton of in my journals. The base of this page is a scrap of canvas with a yellow background and blue dots. It’s a leftover from an old project, so the color and pattern were already there and waiting for decoration. 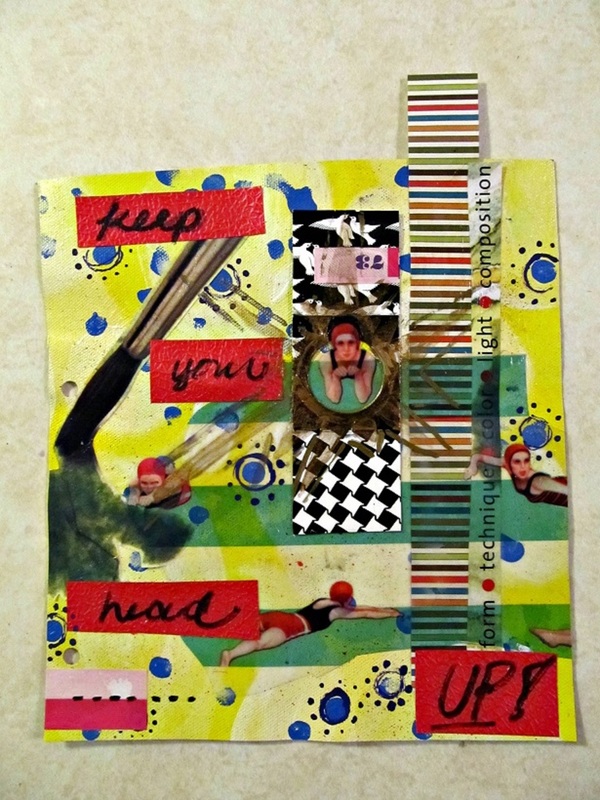 And such happy colors are wonderful for making a page like this one where I am trying to encourage myself. On top of that, I did add papers and a bit of paint, but the large, very shiny piece with the swimming ladies on it is scrap vinyl. I believe it was a shower curtain at one point. You don’t get much further from paper than that. Boy, that is a lot of shine! Vinyl plus gel medium and metallic paints will do that. 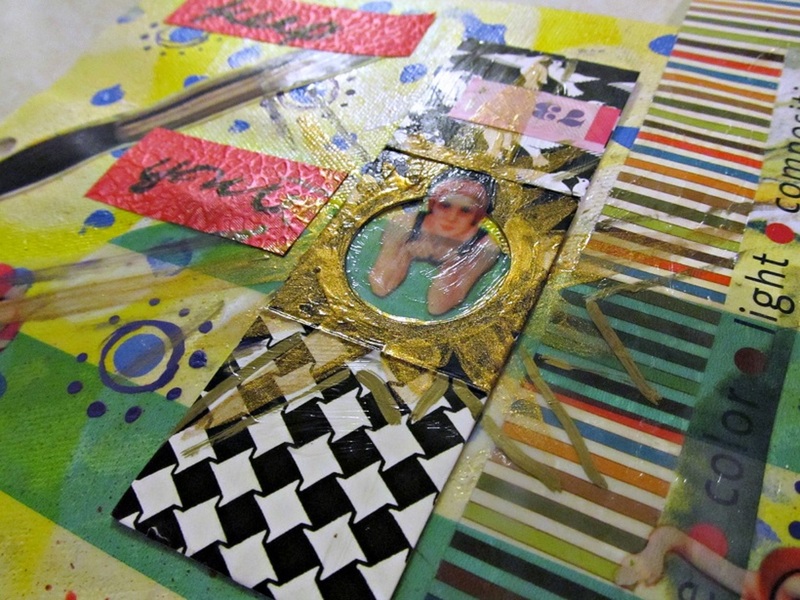 But you can see hints of gold accents around my swimming lady. If canvas and vinyl are too far outside your comfort zone or you just don’t have any “strange” materials, just consider adding something you have never used to a standard paper journal page. Beautifully printed tea wrappers, fabric scraps, foil from candy bars, bubble wrap, old postcards and patterned napkins are all good options and pretty readily available. As you get more and more into visual journaling, you will find yourself unconsciously saving materials like these for just this type of project. And if you REALLY get into it, your family and friends will hop on board as well. It’s amazing how many cool materials will just start to materialize. So get them and use them! You may end up finding a new favorite material.